His mother, Nancy Hanks Lincoln (1784-1818), had a similar build and was tall and slender. It was said that Abraham Lincoln inherited his build from her. Only portraits of her exist. 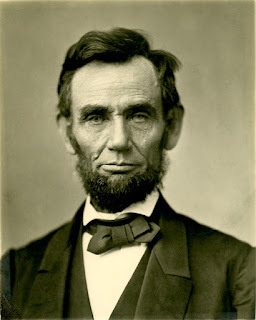 Abraham Lincoln is sad to have suffered from bouts of depression, but otherwise he is said to have had great energy and generally good health. One of the great debates about President' Lincoln's health is whether or not he had Marfan syndrome. Interestingly, some of the evidence comes from photographs. Not just the ones that give a clear image, but also those where his feet or his head seemed blurred. In 1962 a Cincinnati physician, Dr A.M. Gordon suggested that the president's appearance was suggestive of Marfan syndrome. Marfan syndrome is a disorder of the body's connective tissues, a group of tissues that maintain the structure of the body and support internal organs and other tissues. it was first described by Dr Antoine-Bernard Marfan in 1896. The defective fibrillin gene also causes some bones to grow longer than they should. A person with Marfan syndrome may grow tall because their arms and legs grow for longer than normal. In 1964 a Californian cardiologist, Dr Harold Schwartz described the case of a 7 year old child that he had diagnosed with Marfan syndrome. 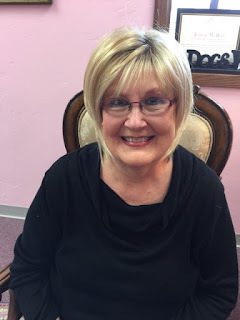 Her ancestry could be traced back to Lincoln's great, great grandfather, Mordecai Lincoln ll. Drs Gordon and Schwarz supported the view that Abraham Lincoln probably did have Marfan syndrome. However, this was debated against by Dr J Willard Montgomery, on the grounds that his health was so good and it was unlikely that he had any heart problems, as are common in Marfan syndrome. The pulse has been recognised as being a fundamental and measurable sign of health or illness by every culture in the world. 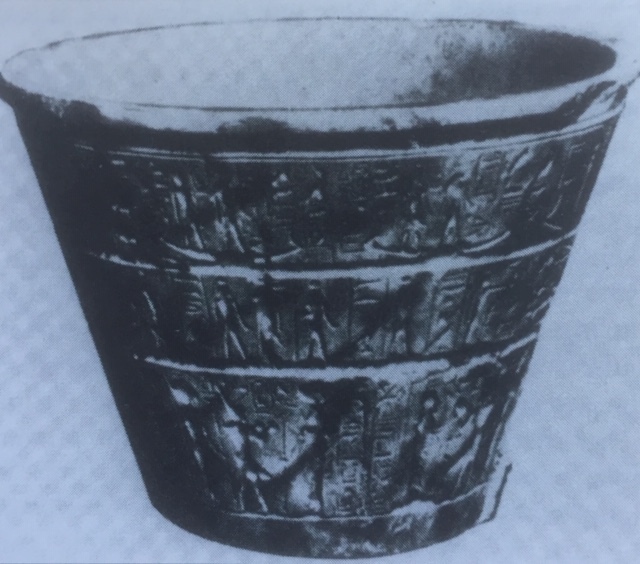 The earliest references to it are to be found in the Ebers papyrus and the Edwin Smith papyrus, two texts on medicine and surgery from Ancient Egypt. There are specific hieroglyphs for measuring the pulse at the wrist, and instructions on assessing it by using a water clock made from an earthenware vessel with a hole in the bottom through which water escaped drop by drop. Although the Egyptians used a water clock and the Romans developed hour-glasses to try to measure the pulse, it was not until the Renaissance that a more practical method was developed. Interestingly, this came about through the work of the genius, Galileo Galilei, who designed a clock with a pendulum. He called this a ‘pulsogium.’ He developed the idea from a principle he discovered in 1583 by timing the oscillations of a chandelier on the altar of the Cathedral of Pisa against his own pulse. Over the next century pulse clocks of greater sophistication were developed by Santorio Santorio and Christian Huygen, but it was not until the eighteenth century that watches capable of measuring minutes and seconds could be adapted to the purpose. In 1707 Sir John Floyer, a Staffordsire physician invented a small pulse watch and published a landmark book entitled ‘The Physician’s Pulse Watch.’We still use that technique to feel the pulse of life. Physicians over the centuries worked out that differences in rate, rhythm and character of the pulse were indicative of various anomalies of the heart. One very specific heart anomaly, which is commonly in Marfan syndrome is called aortic insufficiency. It occurs when the aortic valve in the heart, one of four heart valves, does not close completely during heart beats. It effectively leaks. Over time, this can lead impaired circulation of blood and the person may get breathless on exertion and when lying down. There are many, many signs that have been associated with the curious pulse that occurs in aortic insufficiency. In the past it was considered a significant contribution to medicine if a doctor had a sign named after him. Aortic insufficiency had an unusually large number of such signs. 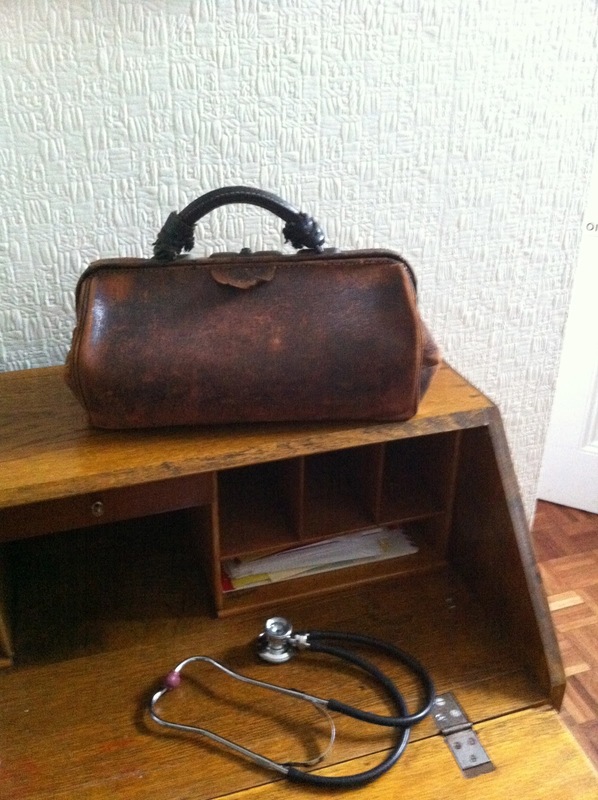 This was the name of the 'collapsing pulse' that characterises aortic insufficiency. 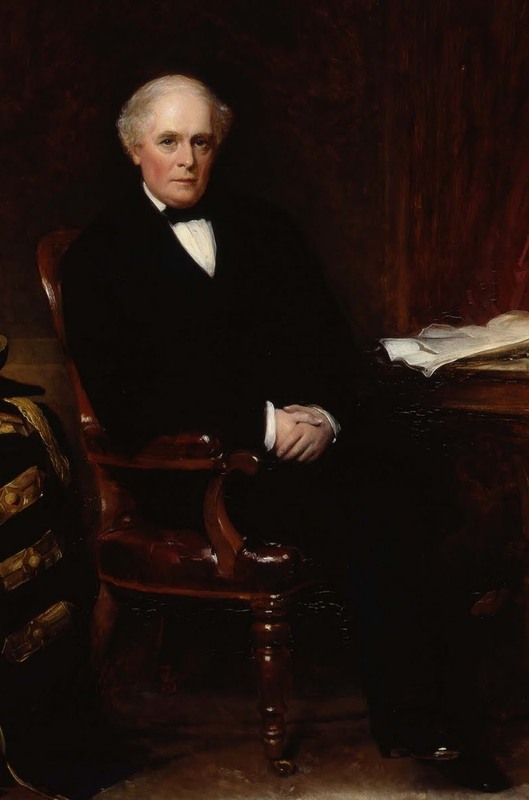 It was named after Sir Dominic Corrigan (1802-1880), a Dublin born physician. It was also called the cannonball, collapsing, pistol-shot, trip-hammer or water-hammer pulse - or most poetically, the vascular dance. A visibly pulsation can be seen in the carotid arteries in the neck. A manifestation of the vascular dance of aortic insufficiency is the way that the user leg bounces when the legs are crossed at the knee. In 1972 Dr Harold Schwartz published an article about an anecdote about a photograph in the possession of the National Library of Medicine. Lincoln said when it was taken that his left foot seemed blurry in the photograph. Noah Brooks, a journalist who was interviewing him suggested it was because the president was seeing his arteries pulse when the legs were crossed. Lincoln tested it and exclaimed "That's it! That's it! No that's curious, isn't it?" The long exposure of the camera, due to the increased shutter time, would catch the leg movements and blur the image of the foot. Schwartz suggested that this should be called the Lincoln-Brook sign, an indicator of aortic insufficiency. Interestingly, in later life Lincoln was noted to nod his head-on every heartbeat and on some photographs with the increased shutter time, his head appeared blurred. 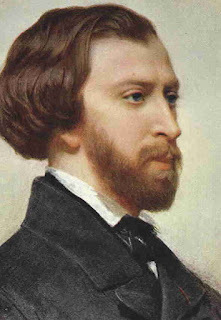 This phenomenon is actually called de Musset's sign. It was named not after a doctor, but a patient, the French poet Alfred de Musset, who died from syphilitic aortic insufficiency. Without testing Abraham Lincoln's DNA the debate will go on. Blood-stained artefacts from the president might give sufficient DNA to determine whether or not he had a gene that could give rise to Marfan syndrome, or to one of the other possibilities. That, of course, raises many questions (some ethical) as to whether such analysis should be done. Until then, the blurred photograph phenomenon is interesting. The 'Pike's Peak or Bust' gold rush began one hundred sixty years ago, when gold was found near Cherry Creek, in the now Denver Metro area. (Actually the gold was found in 1858, but the rush began in 1859). Now for those unfamiliar with Colorado's topography, Pikes Peak is actually around seventy miles south of the area where the gold was found. So why "Pikes Peak or Bust'? 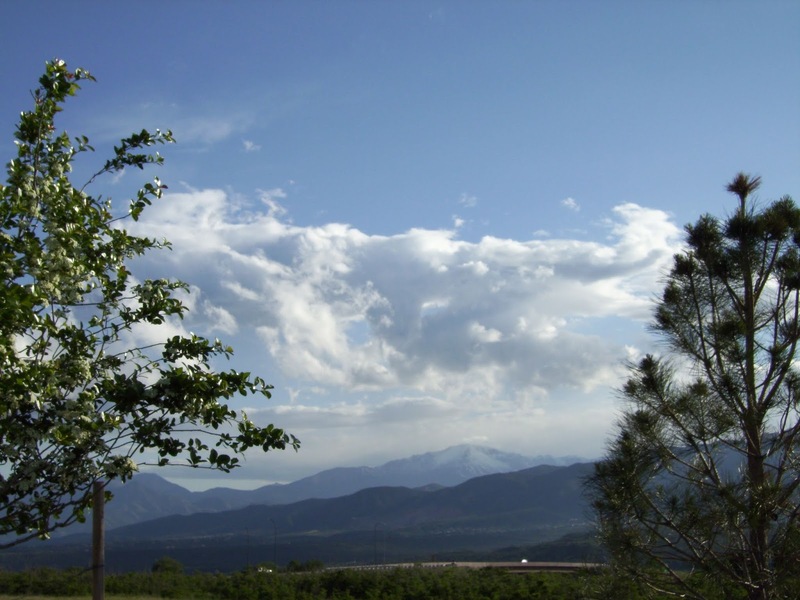 Well, the peak sits the eastern most in the mountain chain that runs through Colorado. Additionally, it is a stand alone fourteener peak. The nearest at its elevation or higher is over seventy miles away. In other words, its the landmark you see first as you're heading west. And by 1900 Colorado was providing more gold than any other area, including Alaska, most of it coming from the Cripple Creek/Victor mining district. (They're still pulling gold out of that mountain) But there was/is more than just gold in those mountains and the plains. 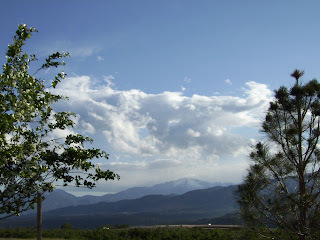 Colorado, thanks to the area around Leadville, also produced large amounts of silver. The state also has provided the world with marble, zinc, lead, molybdenum, uranium, nahcolite (which produces baking soda and soda ash) in addition to gemstones. Colorado also has diamonds, which have been mined up near the Wyoming boarder. Add to this coal mining which has occurred almost since Colorado was settled and you have a wealth of mining and mining history. 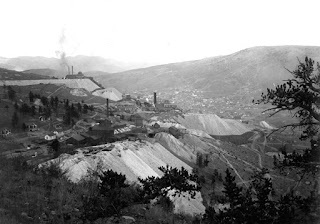 Colorado Springs in the 1800s had fifty active coal mines in the area. Of course, Fremont county had numerous coal mines as did the southern part of the state where the Ludlow Massacre occurred. The pulling of 'treasure' from the ground created stories of wealth, life, death, strikes and massacres. 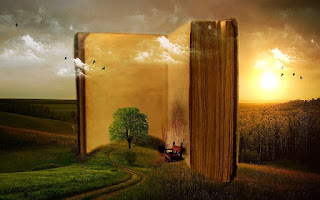 These stories are mined by myself and others for the books, papers, and novellas we write. One novella "Never Had a Chance" came from a piece I read in the Sandra Dallas book. So do you want to do some mining? When the cold weather starts up (and seems to continue forever! ), I’m all too ready to just hunker down and get out of the Oklahoma wind—the older I get, the more I feel that way. But one thing I’ve discovered: If you have plenty of food (for both humans and the dog), running water, and firewood, it’s not terrible. Well, until you have to go out for MORE food! ONE OF THE FEW STORIES I'VE WRITTEN THAT TAKES PLACE DURING WINTER! This revised and updated edition contains the most important writings of Charles Eastman (Ohiyesa), the first Native American author to live simultaneously in both the traditional world of the Santee Sioux and the modern civilization of the white man. 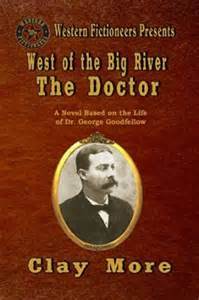 Dr. Eastman also attended the injured at the Battle of Wounded Knee. 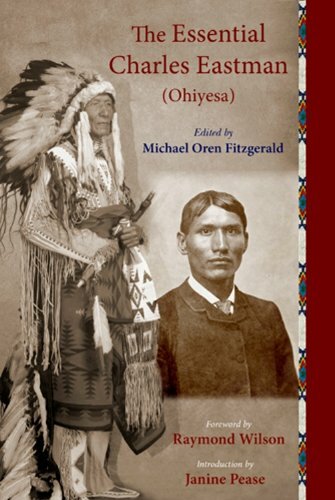 Ohiyesa's works represent a complete explanation of the philosophy and moral code of the Plains Indian. Ohiyesa's message speaks to every person who seeks a spiritual way in the midst of a society increasingly dominated by materialism and industrial technology. Sun Dance chief, James Trosper writes, It is a small miracle that these important spiritual teachings have been preserved for us. This new edition contains 10 sepia photographs from Eastman's life and a thought-provoking foreword by Raymond Wilson. There are a LOT of books of writings by Charles Eastman—very thought provoking and just downright wonderful, in my opinion. 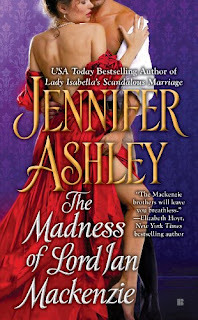 Okay, not a western, but a ROMANCE-- THE MADNESS OF LORD IAN MACKENZIE is book 1 in the "Highland Pleasures" series, or what is known as The Mackenzies. This is an excellent tale by Jennifer Ashley, a shorter piece, and it has a hero you will not likely forget. Ian Mackenzie is afflicted by something—because of the time period this story takes place in, we don’t really know what it is, but it could be autism, could Asperger’s Syndrome—and he is very different. This is the first in a series and I would like to read the others! 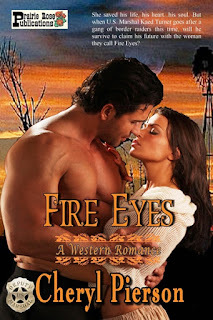 I will leave you with an excerpt from FIRE EYES that takes place (appropriately!) in my heroine’s cabin. 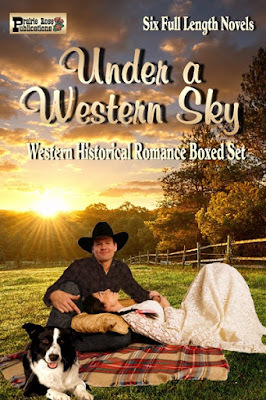 FIRE EYES is part of a 6-book boxed set, UNDER A WESTERN SKY! 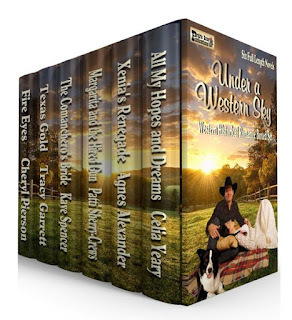 I’m so proud to have my story in this set with 6 different authors (Agnes Alexander, Celia Yeary, Kaye Spencer, Patti Sherry-Crews, Tracy Garrett and Cheryl Pierson). The best part is, it’s only .99 right now! For Marvel Comics' 80th anniversary, the company is doing special one-shots briefly resurrecting some of their lesser known titles from years past with an all-new story. 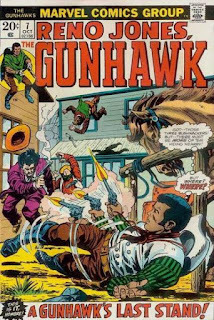 I believe this is going to be a monthly feature, because last month was the 1970s war comic WAR IS HELL, and this month it is the 1970s western title GUNHAWKS. I have heard future months will feature some of their horror, sci fi, and romance titles from previous decades. GUNHAWKS was a different sort of western which originally ran for only seven issues, in 1972-73. 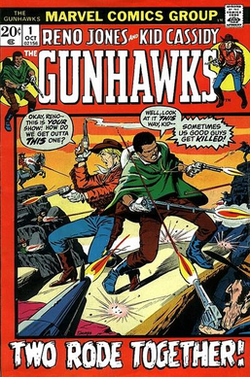 The full title was RENO JONES AND KID CASSIDY: GUNHAWKS. 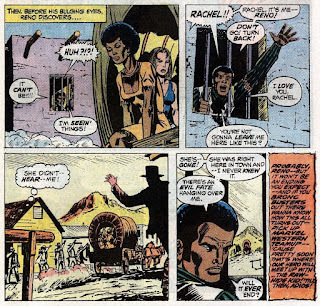 It was written by Gary Friedrich and drawn by Syd Shores. Warning- spoilers ahead for the 1970s series. Cassidy was the son of a Georgia plantation owner, and Jones was a slave whose mother was the cook in the big house. 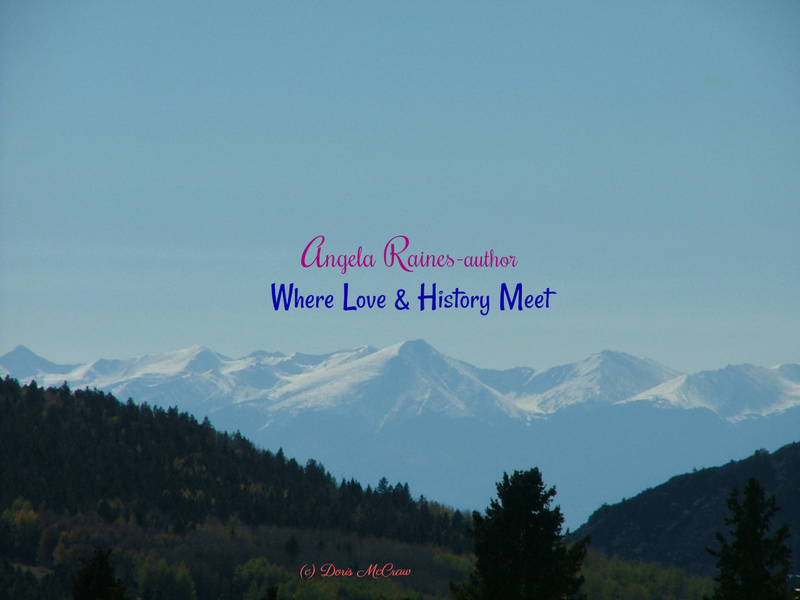 The same age, they grew up together as friends -and when the Civil War started Reno was conflicted. 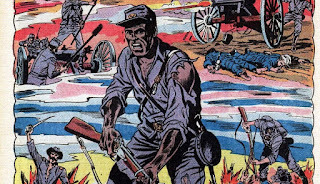 Cassidy marched away with the Confederate Army, and many of the male slaves joined the Union Army. Reno felt loyalty to the Cassidy family because its patriarch had paid his slaves wages and allowed them to come and go at will. Unwilling to fight against either side, he stayed behind to help the old man look after the plantation. 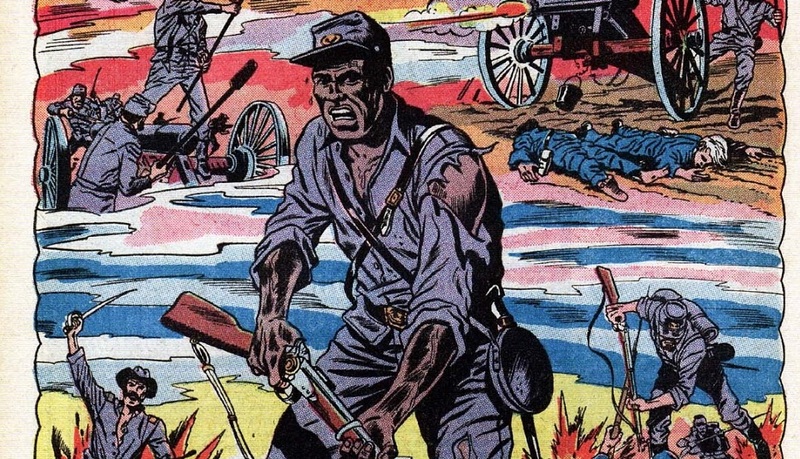 When the Yankees came they killed all the men defending the plantation except for Reno, whom they left for dead. They abducted his girlfriend and fellow slave Rachel. 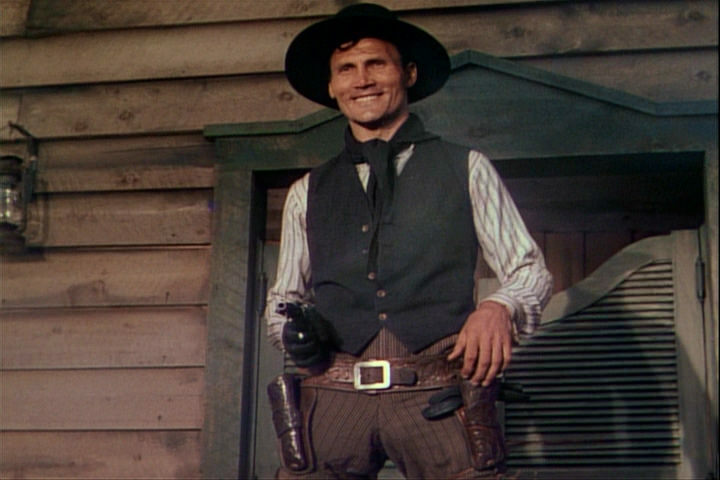 Filled with a desire for vengeance, he joins the Confederate Army to kill Yankees. At the end of the war Kid Cassidy and Reno Jones are joyfully reunited when they both return to the ruined plantation. They decide to start a new life out West, and head to Kansas to become buffalo hunters. They are constantly confronted with difficulties due to prejudice against Reno. 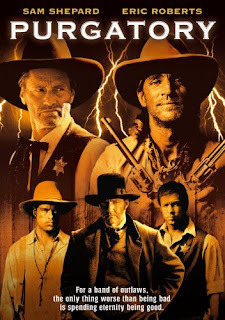 When they are attacked by rival buffalo hunters who want to steal their take and kill one, Reno finds Rachel's locket in the dead man's possession. They hunt down the others, and learn from them that they occasionally work for another transplanted Southerner, a former Confederate colonel who is still using black people as slave labor, abducting them and sometimes selling them. Rachel had been in his possession, but had been abducted in a recent Cheyenne raid on the farm. 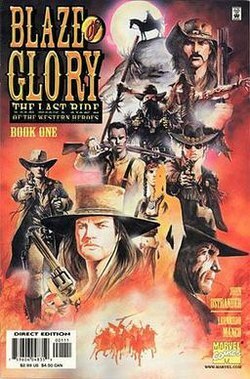 Reno organizes an uprising among the "slaves," who kill the colonel. Soon the two heroes are caught in the middle between the Cheyennes and a Custer-like cavalry officer prone to large-scale slaughter of women and children. They are separated, with Cassidy taken captive by the Indians and Reno imprisoned by the army. 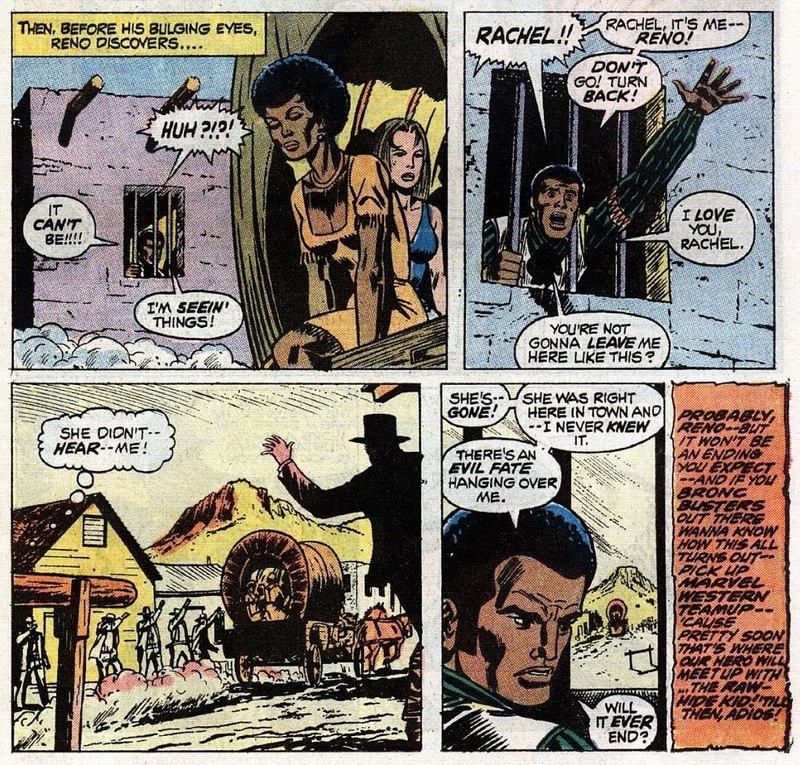 Cassidy learns that Rachel is among the survivors of the village, but does not want Reno to know she is still alive because she has been taken as wife by the band's leader, Gray Fox, and does not want her beloved to ever learn of her shame. 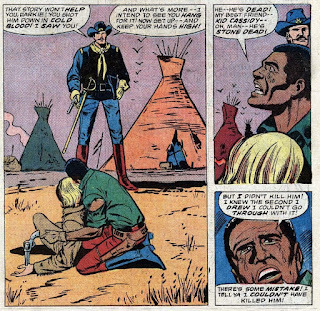 Reno eventually gains his own freedom and arrives at the Cheyenne village to rescue Cassidy, with the cavalry hot on his heels. The Indians retreat, and Reno sees Rachel among them. When he tries to go after her, Cassidy -having sworn to protect Rachel's secret -stops him. 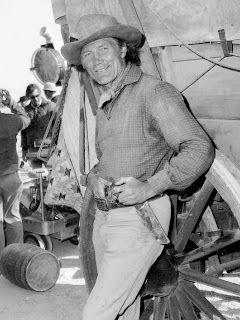 He refuses to give an explanation for doing so, and Reno angrily draws his pistol and threatens to kill him -just as the cavalry arrive. Reno fires but deliberately misses. Simultaneously, however, Gray Fox -who had doubled back, still in possession of Rachel -takes aim at the hated cavalry colonel and fires. Fearing he may accidentally hit Reno, Rachel tries to knock aside his rifle -and he accidentally shoots and kills Kid Cassidy instead. The colonel demands Reno be arrested for murder, even though one of his men had seen the puff of smoke from Gray Fox's rifle in the trees. Reno manages to escape, stricken with grief. Gray Fox finds him and attempts to kill him so as to no longer have a rival for Rachel's affection. 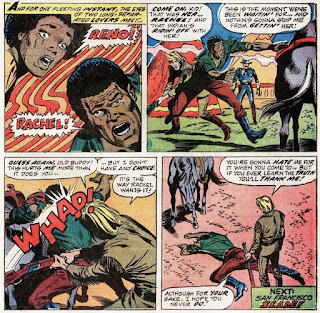 During the fight, in which Reno kills the Cheyenne leader, Rachel runs away yet again. 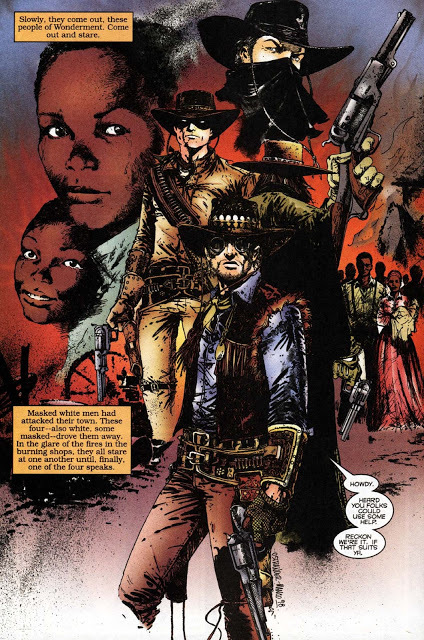 The death of Kid Cassidy and the subsequent events I described take place in issue #6. 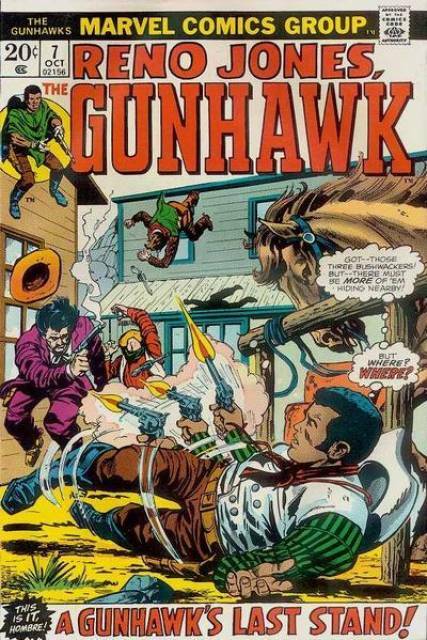 With issue #7 the series is renamed RENO JONES, GUNHAWK. 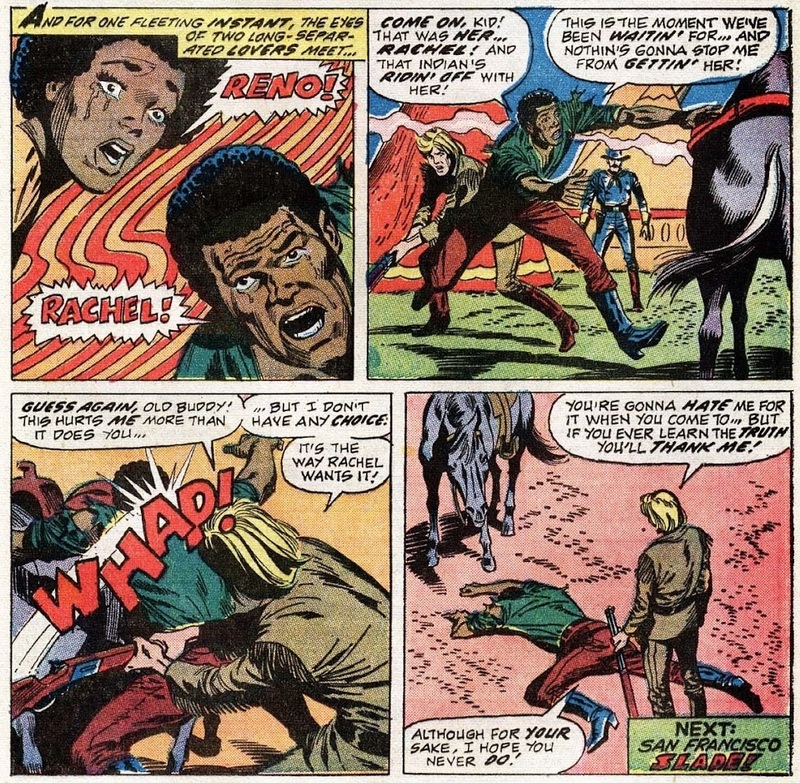 Reno had really been the primary protagonist anyhow, with Cassidy playing a supporting role, which is not what one might have expected in a 1972 comic. 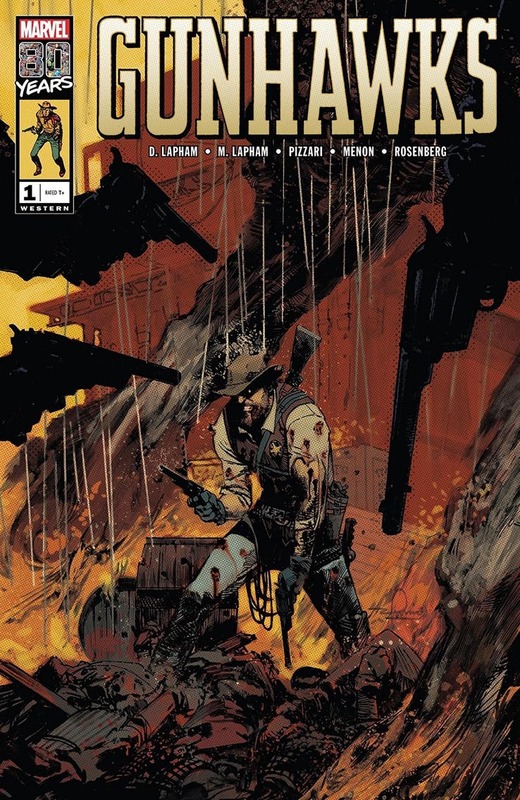 Issue #7 finds Reno trying to track down his beloved, but now a fugitive with bounty hunters tracking him. That issue ends with him captured and in jail awaiting hanging. 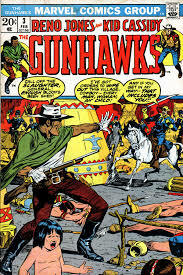 There was no notification of the book's cancellation, just a message at the end that Reno's fate would soon be revealed in a team-up with the Rawhide Kid. And it was... it just took a quarter of a century. 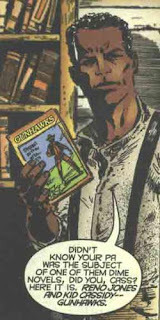 Reno Jones played a central role in the 1999 miniseries (collected as a graphic novel) BLAZE OF GLORY by John Ostrander and Leonardo Manco. This book was mentioned in my 2013 interview with John Ostrander at this very blog, You can read that interview HERE. 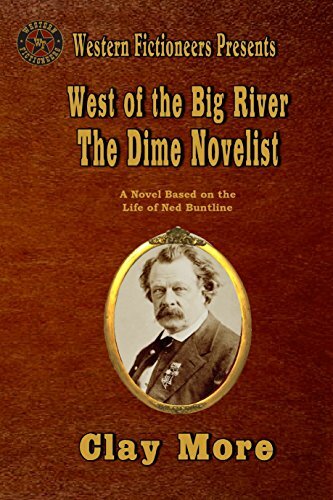 It seems that Reno had escaped execution and roamed the West looking for Rachel, befriending along the way other western heroes such as the Rawhide Kid and the Two-Gun Kid. 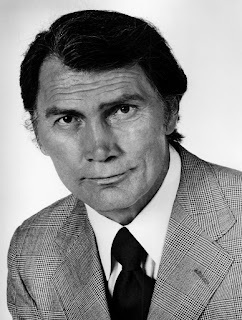 Many years later, having abandoned his quest for a woman who did not want him, he has married someone else and started a family and is living in the Exoduster town of Wonderment, Montana (with his wife Mary and a son he named Cassidy). 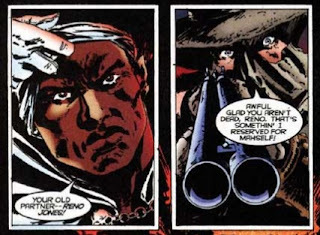 A local land baron wants the African American community gone, and hires a group of hooded racist enforcers called the Nightriders to slaughter the town. 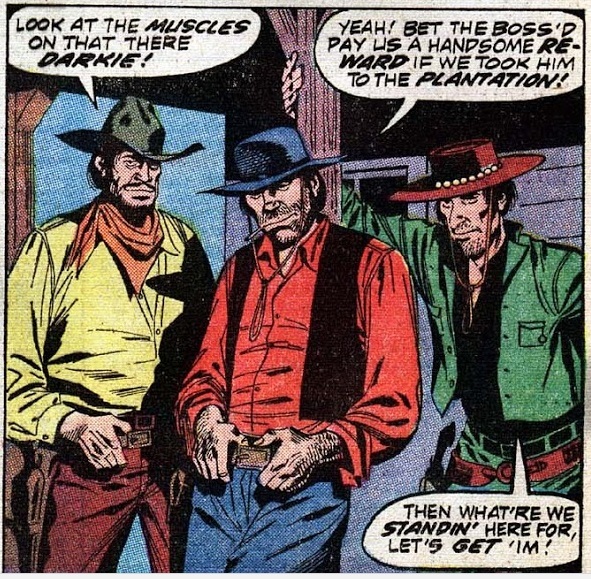 Reno sends word to his friends for help, and all the major Marvel western heroes show up for a dramatic stand against the Nightriders (with several of the heroes perishing in the process). In an unexpected twist, the leader of the Nightriders is none other than Kid Cassidy. He had survived the gunshot which he believed came from his disloyal best friend, and as a result was consumed with hatred for not just Reno but black people in general. This time Reno kills him for real. 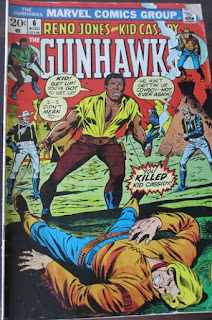 All right, that catches you up on the legacy of the Gunhawks. There will be no spoilers for the new one, just a description and set-up. 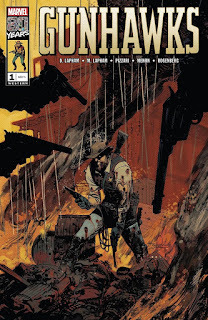 You can buy the new one at amazon and other sites, but be forewarned that a single issue of a comic book is now four bucks. The new iteration has nothing in common with the original except for the genre and the title. It is an all-new story with new characters. It is drawn by Luca Pizzari and written by David and Maria Lapham, who are best known for their classic gritty crime series STRAY BULLETS. The new "Gunhawk" is Dean Donnelly, recently married sheriff of Clearwater, Arizona in 1914. 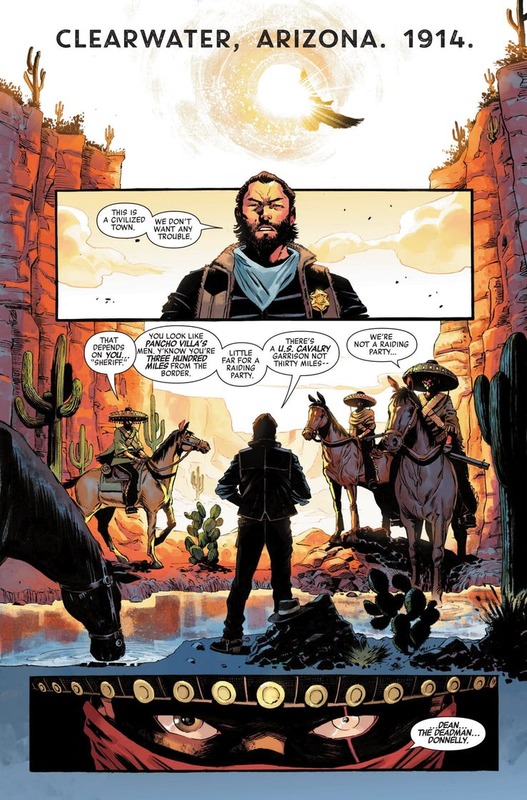 The town did not know his secret, though- that before coming there to be sheriff he had been a ruthless mercenary in the employ of Mexican usurper Victoriano Huerta against Pancho Villa and other rebels. This single-issue comic is the story of how his past catches up to him. The book also includes a brief editorial about the important place the western genre has held in the history of Marvel Comics, and how it has been making a comeback in comics the past few years. If you're like me, you are always happy to see a new western from any comics publisher. 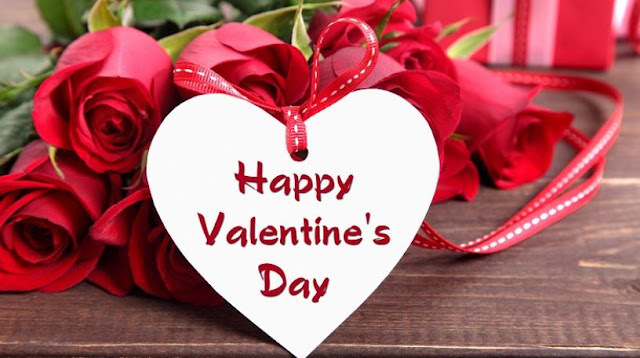 HAPPY VALENTINE'S DAY, WESTERN FICTIONEERS AND READERS! ...except for the supporting villain in my western historical romance, THE COMANCHERO’S BRIDE. 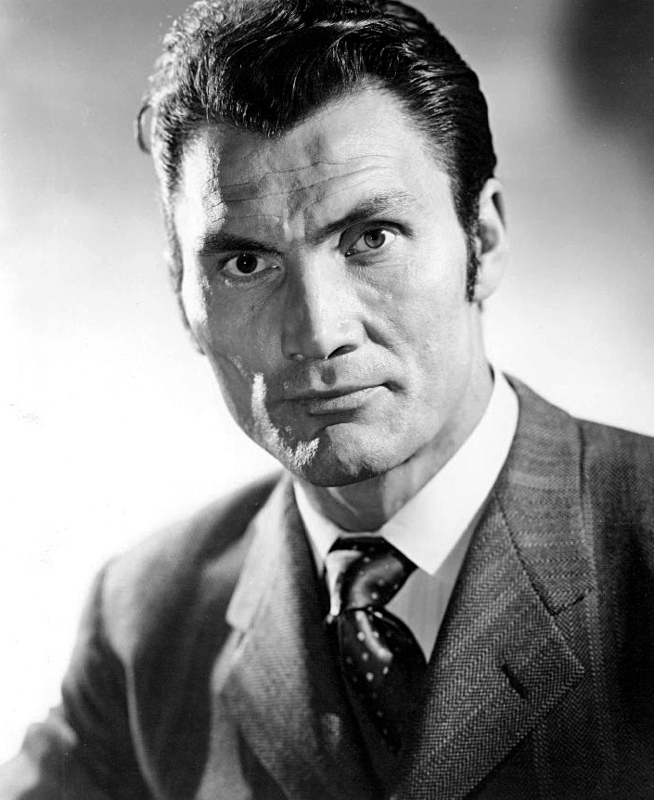 I deliberately created this villainous character in the image of a well-known Hollywood villain of his time, Jack Palance. Birth name:Vladimir Ivanovich Palahniuk of Ukranian descent and born in Lattimer Mines, Pennsylvania, which was coal country. His father an anthracite miner, who died of black lung disease. Anecdote: While an understudy to Marlon Brando … Brando, who was into athletics, rigged up a punching bag in the theater’s boiler room and invited Jack to work out with him. One night, Jack threw a hard punch that missed the bag and landed square on Brando’s nose. The star had to be hospitalized and understudy Palance created his own big break by going on for Brando. Jack’s reviews as Stanley Kowalski helped get him a 20th Century-Fox contract. Host of Ripley's Believe It or Not! Many of you will recall his famous one-handed push up during his Oscar acceptance speech. Grayson and Doyle turned as one person to stare at the man standing beside their table. Grayson sized him up in a glance and didn’t like what he saw. 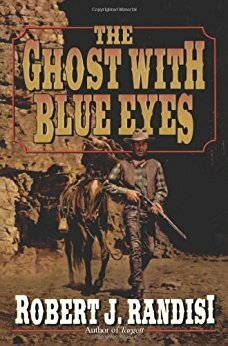 The stranger was tall, grizzled and unkempt, clad in weather-worn, dirty buckskins, and he sported a battered, sweat-stained hat cocked at an angle over shoulder-length gray scraggly hair. 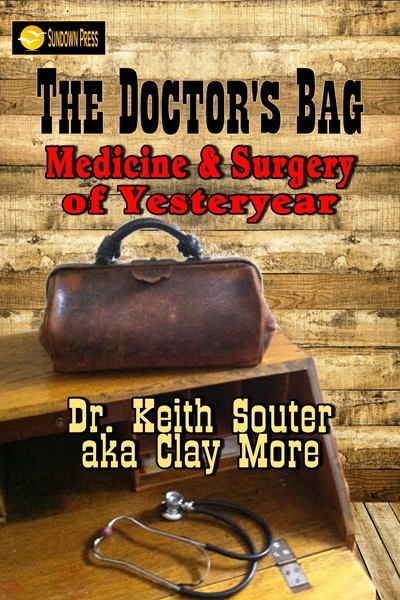 He carried a faded military haversack slung across his body. His rifle, muzzle pointed down, rested in the crook of his right arm, which lifted his right shoulder higher than the left with a rounded, misshapen hump. He had the look of a mountain man, mean, rough-hewn, and hard as granite, but his defining feature was his puckered eye that drew the left side of his face into a disturbing grin. The eye itself was canted in the socket, a milky white-blue orb that sometimes seemed to focus and other times to look right past a person. Although the man was starkly out of place in the swank surroundings, he didn’t seem to notice, or, more importantly, didn’t care. Grayson saw the concierge watching from the doorway, his expression strained and demeanor nervous at this stranger’s presence, inappropriately attired as he was for this establishment and that he openly carried a rifle. Grayson made a mental note to slip a hefty tip to the concierge to buy his cooperation. “Who are you?” Grayson demanded. Grayson reassessed the man coolly, his initial unfavorable impression changing. This crude-cast stranger might just be the sort of man he needed. “Have a seat.” Although Grayson nodded to the concierge that all was well and the small man visibly relaxed, although he maintained his watchful position at the doorway. Grayson offered bourbon, and a chair across the table, but Jack declined both with a slight head shake then took a chair that put his back to the wall and beside Grayson. Grayson exchanged a quick glance with Doyle.